That is a trip covering hikes through the Berber villages without a Toubkal ascent. It is a great way to introduce the authenticity of the preserved area of the natural park, meet with the local people, see cave paintings of Oukaimeden and of course enjoy views of the High Atlas range. We will begin our hike by discovering the ingenuity of Berber mountains. An easy path will take us towards the pass of Techt (1950m). After a short descent, we will reach the village of Ait Aissa in a valley with many earth tones. After breakfast, we will follow our way to Tizi Oussem and Tamsoulte (2400m). After lunch and a snooze in the sun under the spray of the waterfall, we will continue to descend the same path back to Tizi Oussem. Overnight in a local lodge. 5 hours of walking. 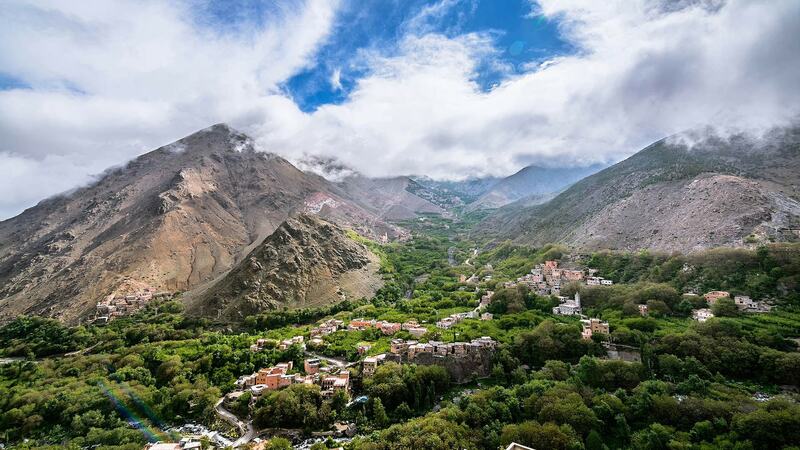 We will follow a trail at the foot of the Toubkal Mountain with several views of Azzadene Valley. After 2,5 hours of walking, we will reach the Mzik pass (2450m). Descend towards the Imlil valley and its green valley landscape of the terraced orchards will take us to the village of Aremd. Following a paved road alternated by a narrow path (sometimes in the shade of walnut trees and Aleppo pines) we will reach Tizi n'Tamatert (2200m) with superb views of the Imenane Valley. Once over the pass, Tacheddirt, Ouaneskra and Tamguist villages with their stone houses and land nested within each other will welcome us. 5 hours of walking, night in a local guesthouse. We will the path that leads to Tizi n'Addi mountain pass (2900m) with a splendid panoramic views on villages and passes we crossed in the previous days. Lunch near a spring, then a chance to visit the rock carvings of Oukaimeden. Down a path lined with juniper trees towards the valley of Oussertek. 5h30 of walking, overnight in a homestay. We descend in the morning passing by the village of Imsker in the Imenane Valley. The pass of el Bour will lead us along a mule trail in a juniper forest to Imi Oughlad (1400m). Lunch by the river. 4h30 hours of walking and 1h30 drive to Marrakech.